Seagate introduced Backup Plus, a new storage device family with one-click backup and the ability to save and share content on Facebook and Flickr. Seagate Technology plc (NASDAQ: STX) today introduced Backup Plus storage devices – its reinvented consumer storage product family that delivers the easiest setup, one-click backup and the ability to save and share your content on Facebook and Flickr. Seagate® Backup Plus hard drives are newly designed external storage that work interchangeably with both Windows® and Apple® computers and deliver new features to protect, share and save nearly every aspect of one’s digital life. These products come loaded with the new hassle-free Seagate Dashboard software for one-click local backup making it easier than ever to eliminate excuses or apprehensions about backing up one’s most valuable digital content. Seagate Backup Plus products are the world’s first external hard drives to provide backup for content on social networks, such as Facebook and Flickr. Storing a local duplicate copy of photos from social networks is now as easy as backing up files on your computer. Seagate Backup Plus will provide the peace of mind that every aspect of one’s digital life is safe from loss. Backing up data is an absolute necessity that many people put off until after it’s too late. According to a 2011 study by Parks Associates less than one-quarter of the households in the survey have a weekly backup plan for their systems and only 4% are diligent enough to manually perform a backup on a daily basis. Seagate Backup Plus hard drives featuring the new Seagate Dashboard backup software remove the barriers to performing backup and content preservation by making it as easy as possible. With just a click of an icon, computer files are replicated onto a Backup Plus drive. The Seagate Dashboard included on Backup Plus also provides a single click path to Save (download) and Share (upload) personal photos and videos on Facebook and Flickr. In 2010, Seagate adopted the Universal Storage Module (USM®) standard, which enables consumers to easily add the newest Mac® and PC connection capabilities to their Seagate storage product even if these technologies are introduced later. To add yet another level of versatility, Seagate has introduced a way to have the company’s external storage products work cross-platform with both Mac® and Windows® operating systems without reformatting. 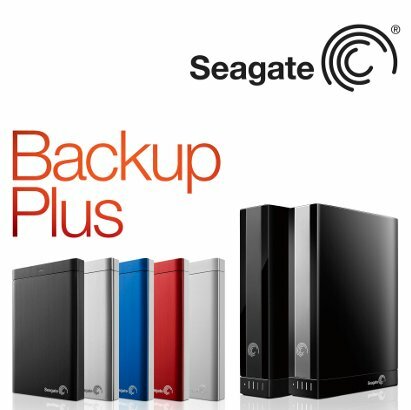 Available immediately from Amazon, BestBuy and other retailers including Seagate.com, Seagate Backup Plus drives will initially be available in capacities of 500GB, 750GB and 1TB capacities for portable drives and 1TB to 4TB for Backup Plus Desk drives. This new family of external storage will be available in red, blue, silver and black for the portable 2.5-inch form factor with a manufacturer’s suggested retail prices at launch are: 500GB, $119.99; 750GB, $129.99 and 1TB, $139.99. The Backup Plus Desk 3.5-inch drive: 1TB, $129.99; 2TB, $149.99; 3TB, $179.99 and 4TB, $249.99 MSRP. Backup Plus for Mac portable is available in silver and will ship in 500GB for an MSRP of $119.99 and 1TB at $139.99. The Backup Plus Desk for Mac will be available at launch for 2TB, $189.99 and 3TB, $209.99 MSRP. Seagate® Slim and Seagate® Slim for Mac storage in a svelte 9.5-mm package will now be available in a 500GB capacity at $129.99 MSRP and will also include the new Seagate Dashboard software for simple backup of on-board and social media albums.